I want to have a client agreement that we can send to our clients and they sign it online. On our end I want a global form that contains all of our different services and pricing that we would choose from to create a custom contract for each client. Once we select which items should be included in the contract, I want it to be sent to the client for their review and signature. Possible? 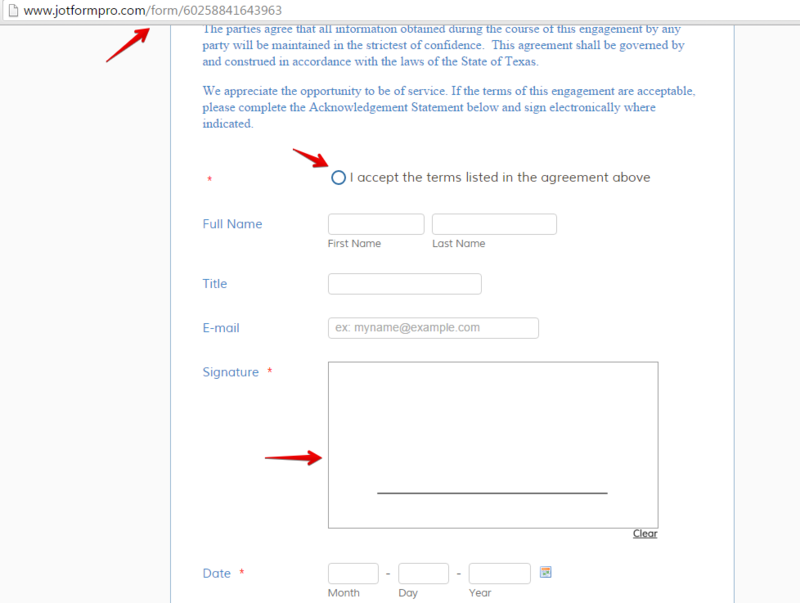 I checked your Consulting Agreement Form http://www.jotformpro.com/form/60258841643963 and I can already see an Agreement text and Signature field that the client can use. Base on what I understand now, the only missing part is the selected items to be in the contract. You can try adding items on the form using the Purchase Order tool . Once the items are on the form, you can pre-select items so that the selected items will be the items in the form. You can use the Field Prepopulator App to have items pre-filled on the form. Hope this help. Let us know if you have further question on the idea I have suggested.